Ghana 2 Cedis 2010-15 - Ghanaian Currency Bank Notes, West African Paper Money, Banknotes, Banknote, Bank-Notes, Coins & Currency. Currency Collector. Pictures of Money, Photos of Bank Notes, Currency Images, Currencies of the World. under ultraviolet light: Denomination block "2", Nkrumah statue, the vertical serial number and the coloured filament fibers (hairs). Wampah (Governor). Security thread: Segmented, metallic, 2 mm wide. Printing method: Intaglio. Issuer: Bank of Ghana. Date of First Issue: 14 May 2010. Date of First Print: 6 March 2010. Date of Issue: 1 July 2015. Date of withdrawal: N/a. Legal tender: Yes. Total issue: Pending. Material: Cotton paper. Printer: Unknown. Texts: Bank of Ghana. 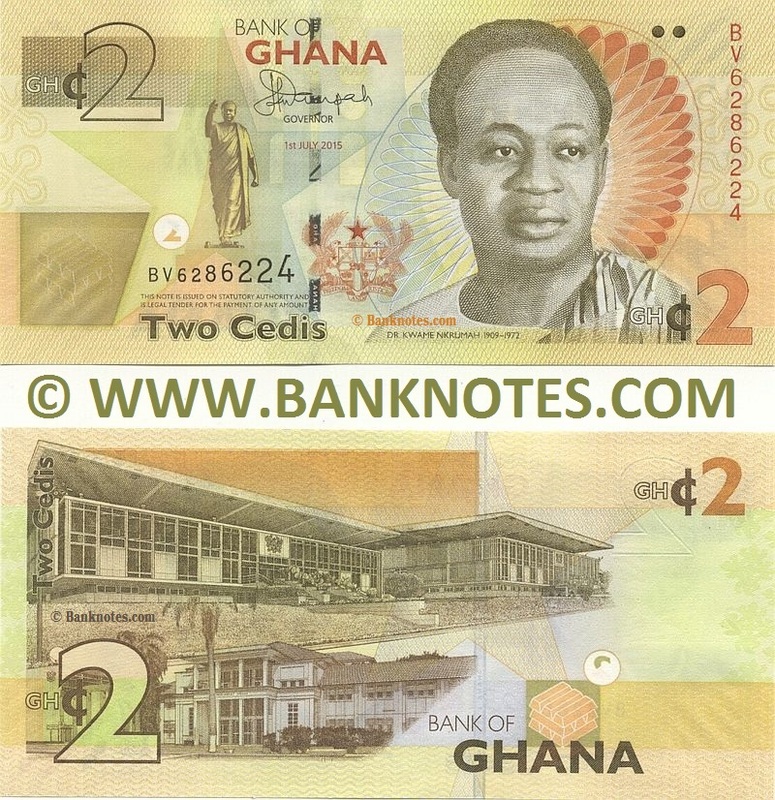 Two Cedis. This note is issued on statutory authority and is legal tender for the payment of any amount. Copyright © 1998-2017 Banknotes.com All rights reserved.